One of the ways that developers accommodated to the area's topography was to construct stairways. 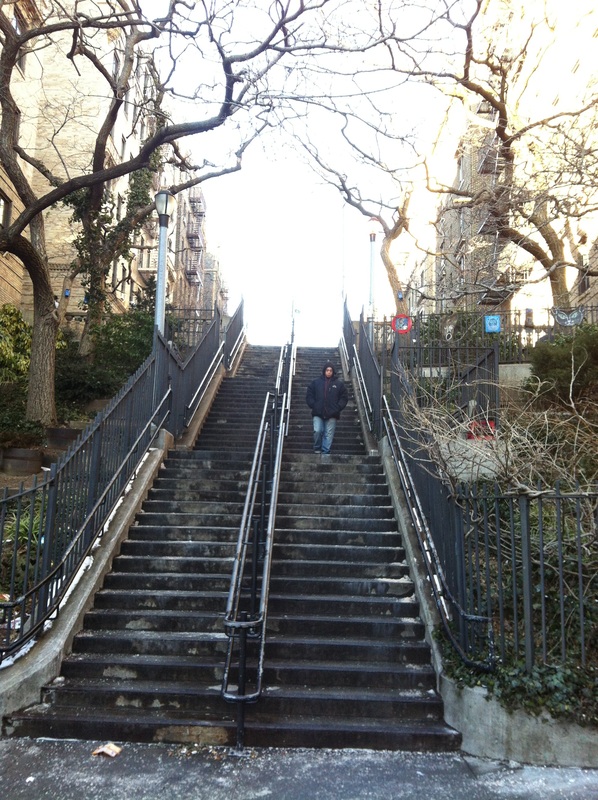 In the book, the West 215th Street Steps, built in 1911 by the city, are featured. Other street stairways in Manhattan can be found at 187th Street and Fort Washington Avenue, at 215th Street and Broadway heading, and an abandoned stairway at Haven Avenue between 172nd and 173rd Streets, according to the Henry Hudson Owners Coalition. Another Manhattan stairway is located at 155th Street between Bradhurst Avenue and Harlem River Drive, according to the New York Stairs map created by Doug Beyerlein. Check out photographs of 155th Street at the Bridge and Tunnel Club website. I have climbed public stairways in Berkeley (with the Berkeley Path Wanderers Association) and in Oakland (also with BPWA but now Oakland paths have their own organization called Oakland Urban Paths). Hilly San Francisco has lots of public stairs. And Los Angeles, too. Are there public stairways where you live? Do you regularly climb them? I have never experienced such stairways in New York, as far as I can remember, but I am but a casual weekend visitor of the city. For me, the stairways in your pictures remind me of Paris, the city I most associate with old, standalone stairs like this, although I have also climbed stairs in San Francisco to reach Twin Peaks. I have never seen any such stairs in Berlin, which is as flat as a pancake, the only "hills" being either gently sloped, slightly elevated neighborhoods or man-made features in parks, constructed of piles of rubble. Too bad! Leslie: I didn't spend enough time in Paris to discover its stairs. Would you mind sharing photos if you have any?